Easter is right around the corner and your kids will love decorating their own Easter Eggs on this fun coloring page. 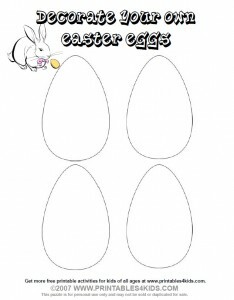 Click on the image to view and print full size or download Easter Egg Coloring Page as a PDF file. Visit our Easter printables category for even more Easter activities. Don’t miss this Free Personalized Easter Bunny Coloring Page either! I print this type of thing out for my 3 year old granddaughter which she receives through old fashioned mail and thinks it wonderful! My 3 year old great-grandson who I see twice a week or so looks forward to me giving him this type of activity. Thanks for the kind words! Have a happy Easter.